I am not the type of person who typically buys a book because of the cover. Sure, I like pretty covers. Sure, I’ll pick one edition over another based on the cover. (I actually tend to prefer old used books that have that particular smell…anyways) But I do not buy books that I don’t find interesting, great cover or no. So, it may surprise you that I was drawn to In the Shadow of Blackbirds because of the cover. Thankfully, I was also intrigued by the paranormal historic mystery promised by the synopsis…but that cover! It is so beautifully haunting that I was going to read this book no matter what! In the Shadow of Blackbirds tells the story of Mary Shelley Black, a bright young woman who must relocate to California after her father is arrested. But California in 1918 is a hard place for a 16 year old; surrounded by the devastating effects of Spanish Influenza, Mary Shelley learns upon arrival that something bad has happened to her childhood sweetheart who is serving in the Army in France. Surrounded by death, thanks to the flu epidemic and World War I, Mary Shelley must attempt to come to age while processing loss, dealing with frauds, and finding the truth in ghostly whispers. Mary Shelley Black was a refreshing heroine! The typical young adult female lead is drowned in teenage angst and plenty of insta-love, but Mary Shelley is a self aware, confident woman of science in an era where that behavior was socially frowned upon. She typically embraces her personality and quirks with little care of what others think. I adored how often she wore her aviator goggles, but loved even more that she wore them because she liked them….not to get a rise out of people, or to make a statement. Despite handling her situation in a stoic, mature fashion, Winters still manages to present a heroine who is both mature for her age but still a child. You don’t forget that Mary Shelley is only 16 years old, because she is still impulsive, as we see with the lightening storm and her decision to help wounded soldiers. She is a wonderful character; a girl who is willing to discover the truth, capable of following her gut instinct, but naïve enough to trust that people are inherently good despite all that she has been through. 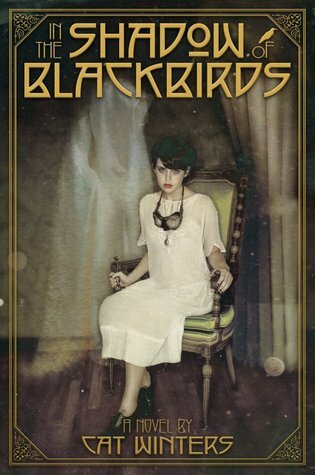 I found the story fascinating, the paranormal aspects engaging, and was thrilled that Winters provided a brilliant standalone novel (instead of trying to force this story into a typical YA duology/trilogy), but I admit the most gripping aspect of In the Shadow of Blackbirds was the year, 1918. I need to read more historical fiction set during the Great War (World War I). Winters’ vivid descriptions of the affects of the Spanish Influenza outbreak, both in physical setting, such as when Mary Shelley comes across stacks of coffins and the constant wailing of ambulance sirens in the background, and in the mental toll on characters battling against an unseen killer, was to me more haunting than the actual haunting! (geez, sorry for the super long sentence guys) And I applaud Winters for her blunt, honest approach on shell shock. She deftly displays the period social reaction to shell shock, at the time a very misunderstood mental and physical reaction to trench warfare, without imparting modern judgement. Winters shows us young soldiers struggling to heal after the war. We hear stories of boys being left by love ones after they lost limbs. We are transported to the bloody mud of the trenches in France, feeling the concussion of artillery shake the ground. And the blackbirds…they may haunt my dreams as they did Stephen’s. Brilliant; her descriptions were absolutely immersive and plain brilliant! I don’t really have any negative thoughts but will say the scenes involving the paranormal can be a tad jumpy and abrupt. I believe this is done intentionally to leave readers a tad unsettled; it works and it can make the book tough to read during long sessions. I also wasn’t a fan of Aunt Eva. She was just too frantic, and wasn’t as developed as Mary Shelley. The gritty details of her somewhat tragic life were there, but these points were overshadowed by her frantic and somewhat irrational response to events. I could tell there was so much more to her and would have loved to see that on the pages. Especially since deep-down Eva is a survivor. I can also see where some readers might complain about the lightening strike, writing it off as a fantastic and convenient plot tool It is but it was still well done, and I have no complaints. In the Shadow of Blackbirds was fantastic, and the perfect read during the month of spooks! I dare say Winters’ may have restored my faith in young adult fiction…..no matter. I recommend it for those in need of a spooky read! Do you have any other spooky young adult books I should check out? Have you read anything else by Cat Winters? Do you know where I can find a pair of vintage aviator goggles?!? Let me know, and happy spooky reading!